Hi guys! Just checking in really quickly before my mom and I leave to see Legally Blonde the Musical at the Muny (Municipal Opera). Did you know that St. Louis is home to America’s oldest and largest outdoor musical theater? 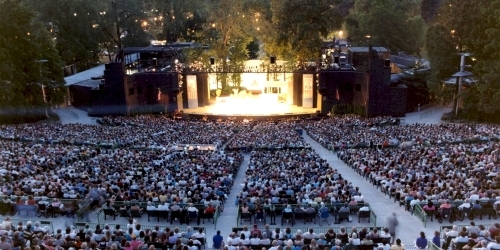 Each summer the Muny puts on 7 shows, each running a week. My grandmother had season tickets for Tuesday night had has passed them on to my family, so now going to the Muny is a summertime tradition. Can’t wait to see this year’s first show! 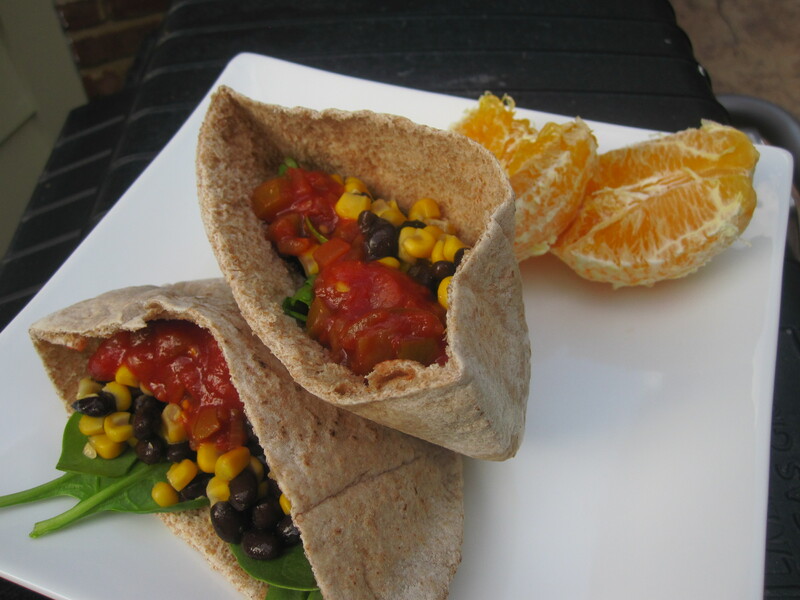 Dinner just now was a whole wheat pita stuffed with corn, black beans, spinach, and salsa. An orange on the side. This simple dinner totally hit the spot for some reason! I’m going to pack up some chocolate chips and almonds to bring as a snack during the show. Then it’s off to Dallas to apartment hunt tomorrow! I’ll try to blog while I’m there. Wish me luck! i LOOOOVE that musical! enjoy!! That’s so sweet that you’re spending a lot of time with your madre before the move!! She’s gonna miss her little girl 🙂 Best of luck in Dallas apartment huntin’! ahh i so wna see it! YAYYY so exciting you got yourself a pair of weight lifting gloves! they totally help with grip and you’re going to lurrrrv them! Ahh good luck! I am apt hunting in Chicago this weekend! I saw Legally Blond the musical a few months ago..it was so cute! I didn’t know LB was a musical now. Cool! That will be such a fun musical to see! 🙂 Sometimes simple dinners are the best–that sounds like a tasty combo! Good luck in Dallas tomorrow! Let me know if you find any good apartments!! Good luck! That theater looks SO cool! I’m jealous! Good luck apartment hunting!! That musical came to Indiana awhile ago, but I didn’t get the chance to see it. I hope you enjoy it! Good luck apartment hunting! I’ve always wanted to see a musical on broadway, since we live so close to NYC, but I’ve never wanted to throw away that much money! If I could go see any musical, I’d love to see the Phantom of the Opera or Lion King. Let me know if Legally Blonde is any good! looks like an awesome place to see a show! Hope you and your mom enjoyed it! I want to see that musical! I hope you enjoyed it :). Good luck finding an apartment! Yum, that pita looks soo good! Hope you enjoyed the musical and good luck apartment hunting! !